New data released this week from the U.S. Census Bureau reaffirm the strong linkage between educational attainment and the marital status and living arrangements of parents of minor children. 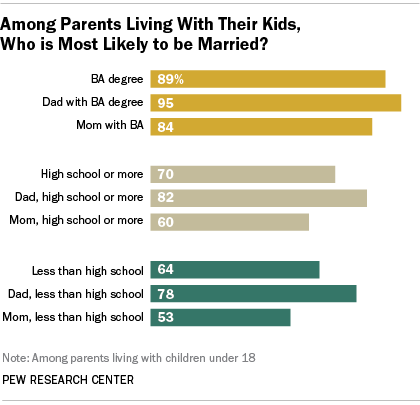 Among parents who live with a child under the age of 18, 89% of college graduates are married, compared with 64% of parents with less than a high school diploma and 70% of those with just a high school diploma. Marriage has been on the decline for decades, particularly for those with less education. At the same time, the share of non-marital births for the less educated has risen dramatically, and the likelihood of divorce remains significantly higher among those lacking a college degree than among those who have one. Not only is there an educational gap in the likelihood of parents living with their minor children being married, but there is a gender gap as well. Just over half (53%) of mothers who lack a high school diploma and who live with their children are married, as compared with 78% of dads with the same educational level. These gender differences narrow considerably — but still persist — among the most educated. Some 84% of moms who have a bachelor’s degree and live with their children are married, compared with 95% of dads with a bachelor’s degree. These gender gaps are largely driven by differences in the patterns of single parenting. While the share of single parents who are dads has risen dramatically, it’s still the case that most single parents are moms. And since divorce and non-marital births are more prevalent among the less educated, that means single parents — particularly single moms — are more prevalent, as well. Approximately 30% of moms with less than a college degree who live with their kids are living without a spouse or partner, as compared with 7% of comparable dads. In comparison, 13% of college-educated moms who live with their kids are living without a spouse or partner, as are 3% of comparable dads.